Having teeth removed seems scary and unpleasant. It’s even a commonly used expression to describe situations that are difficult or inconvenient. But what if we told you that we could make your tooth extraction in Lincoln, NE comfortable and easy? Nebraska Family Dentistry has two primary values: Ensuring your optimal dental health, and offering the utmost comfort while we’re at it. You can find excellent dental care at any of our locations. When you go, you can also expect a comfortable, pleasant experience, even if you’re having teeth removed. Before having a tooth extraction, we’ll usually offer a handful of other options. But sometimes, severe toothache will signify a tooth is too badly damaged, and your Lincoln dentist will need to remove it. This often happens as the result of severe tooth decay, a broken tooth, dental abscess, or a failed root canal. Sometimes, if a tooth extraction is too serious, and we can’t ensure the best care for our patients, we’ll refer him or her to an oral surgeon who specializes in extraction. Our emergency dentists in Lincoln, NE are well-equipped and ready to remove teeth without sacrificing your comfort. In most cases, they’ll be able to extract your teeth safely and comfortably, so you don’t have to be afraid of having a tooth extraction performed. Our goal for every single patient is to offer a pleasant extraction experience. When you come in to have your tooth removed, we’ll examine the area. We’ll look at the severity of the situation and your medical history thoroughly to be sure we take care of your tooth correctly. Once we decide how to go about extraction, we can offer you an option for oral sedation to help reduce anxiety. We can also refer you to our partners at Nebraska Oral and Facial Surgery if you prefer IV sedation. If you’re having concerns about the cost of dental treatment, be sure to let us know. We offer several options to make treatment affordable because we believe everyone is entitled to good oral health. We’re committed to making sure our community can have the good health it deserves. If you don’t have dental insurance, our partners at Lincoln Dental Plans offer the best dental discount plan. To learn more, click the logo to their website below. In general, to remove one tooth without dental insurance in Lincoln, NE costs less than the price of replacing a missing tooth. The price tends to range from $140-$300, depending upon a multitude of factors. If this seems like it will be difficult to manage, please give us a call. We’re glad to talk through your options with you to make sure you get the care you need. Adults usually have a total of 32 teeth. In most cases, patients have their wisdom teeth removed because they tend to grow improperly and ruin the alignment of their teeth. 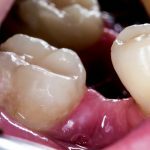 While people almost never replace their wisdom teeth, other extracted teeth are a different story. Over the course of your life, your teeth have developed to allow you to chew and speak effectively. Each of your teeth helps you carry out these tasks daily. Without any of them, you’re less able to do the things you need. Whether it’s as a result of the increased stress of your other teeth or an inability to adequately chew and speak, it won’t take long for you to realize how most take their teeth for granted. With each missing tooth your ability to chew decreases by 10%. Your teeth adjacent to the extracted one will also shift as a result. This usually happens opposite the jaw with the extracted tooth. Below is an example of extrusion or super eruption, which can occur as a consequence of a gap in your teeth. 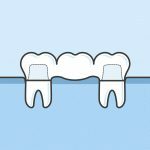 On either side of the extracted tooth, your teeth will tilt vertically until they slowly drift into the spot where a tooth once resided. This increases the risk of decay and gum disease significantly because cleaning an extruded tooth is tough. Any exposed root structures that exist as a result will leave your teeth feeling extra sensitive. They’ll also cause your face to age more quickly since the extracted and extruded teeth will no longer support your face’s bone structure. The loss of facial shape is a natural occurrence when your teeth cause your jaw to change. The cosmetic problems as a result of this change are also significant. A general loss of self-esteem is very prevalent when a person begins to age early. Teeth loss can become very severe if you ignore replacement options. All of our locations are trained to offer excellent care when it comes to replacing teeth. There are many options out there, depending upon your needs and desires. 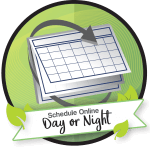 When you set up an appointment, our professionals will be sure to talk to you about the options to help you choose the best choice for your needs. This restoration covers the space where one or more teeth are missing. Your dentist will bond or cement a fixed partial bridge in place so that it will remain stationary. 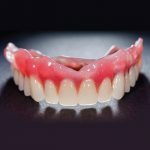 Removable partial dentures, or a removable bridge, will need to be removed for a few hours each day to be cleaned. 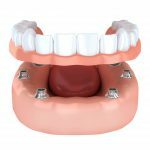 This is a budget-friendly option, although it will not prevent bone loss in your face, and it will not feel as comfortable as a dental implant or fixed dentures. Hybrid Prosthesis is the most efficient tooth replacement option out there. It is, by far, the most consistently stable and aesthetically-pleasing option. In this state of the art procedure, multiple dental implants will be placed and will essentially act like real teeth. Instead of removing them for cleaning, you’ll simply take care of them like natural teeth. Learn more about Hybrid Prosthesis here. 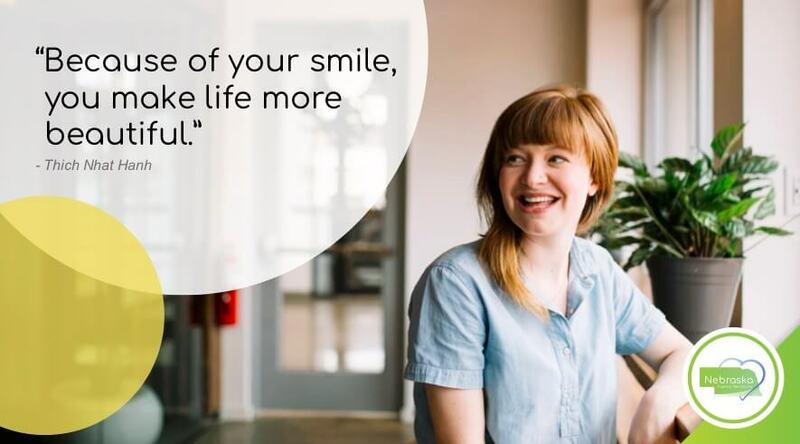 No matter what tooth replacement option you select, remember that Nebraska Family Dentistry is here to help. If you have any questions or concerns, call any of our locations and we’ll be glad to talk you through it.